All 50 states now have two-pager fact sheets on the costs of NAFTA, state-specific. Here’s the link for Oregon’s. 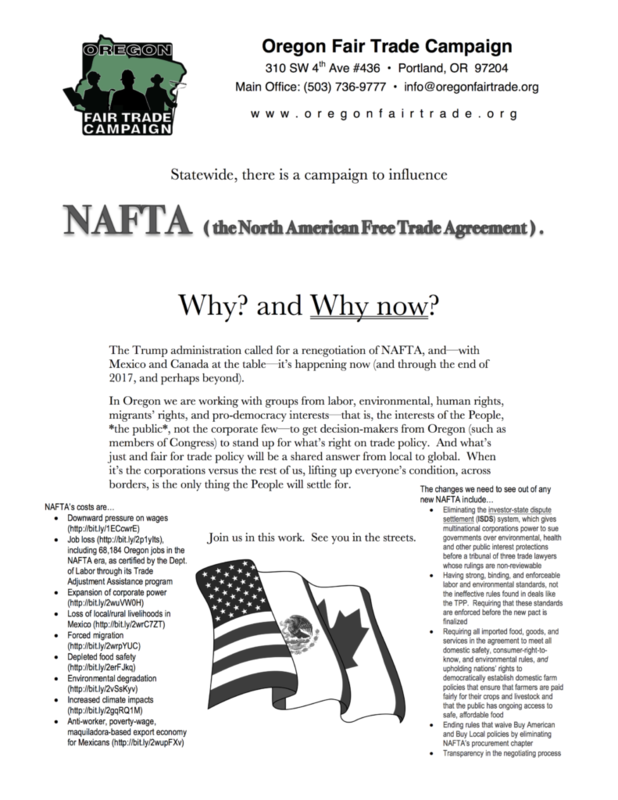 Oregon Fair Trade invites you to get active and get educated in the (really hot right now) issue of jobs and trade. The Trump administration is taking up a rewriting of NAFTA — the North American Free Trade Agreement. What will NAFTA 2.0 look like? Signs point to a renegotiation that may only tinker around the edges of the NAFTA model, a model that has wrought damage of 23 years. 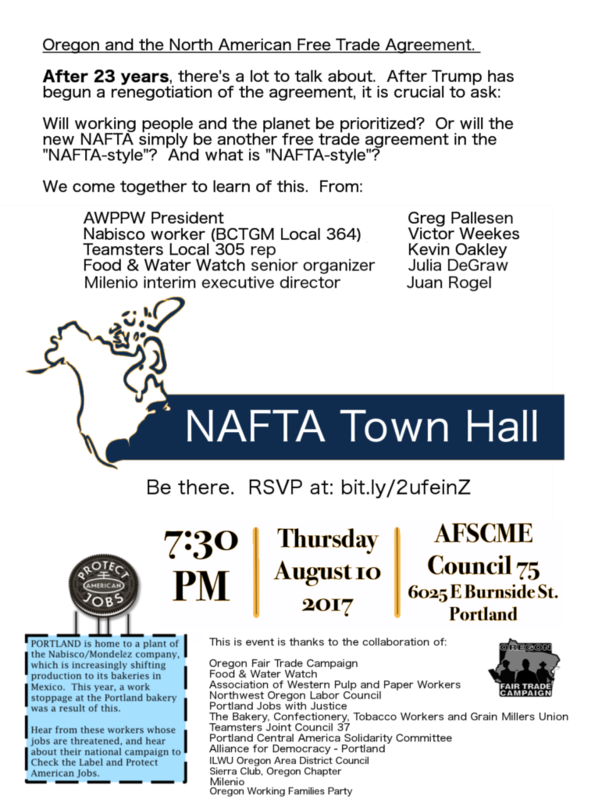 Our event — a NAFTA Town Hall, in Portland on Thursday, August 10 at 7:30 at AFSCME Hall — will educate on the unfolding NAFTA politics and will examine the legacy of NAFTA for Oregonians. 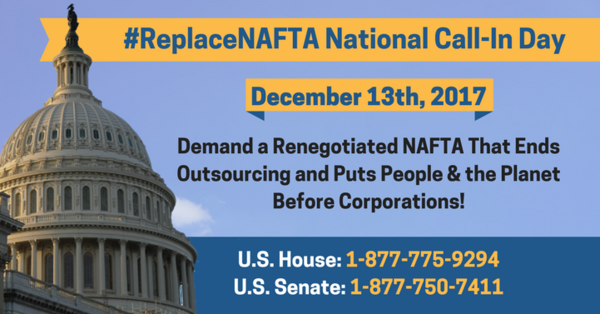 We will hear of the NAFTA-enabled corporate behavior that costs, in livelihoods, on both sides of borders. We will hear from Portland workers, who make Oreos (among other products) for Nabisco, who suffered a work stoppage — and whose jobs are in peril — as part of a large trend of that company’s offshoring. 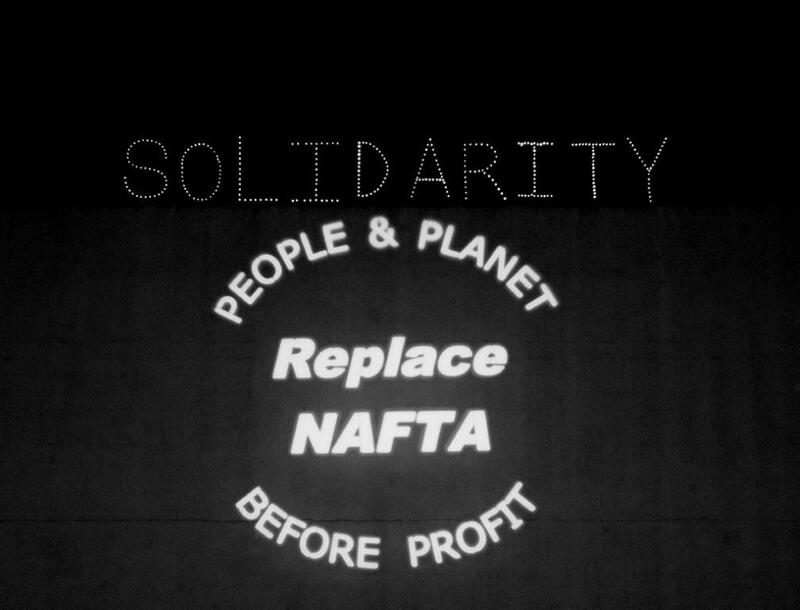 Get in on the uniting around this issue (and the activism that it requires), from many sides of NAFTA’s impacts — job loss, downward pressure on wages, public health and safety, climate change acceleration, migration, and others. 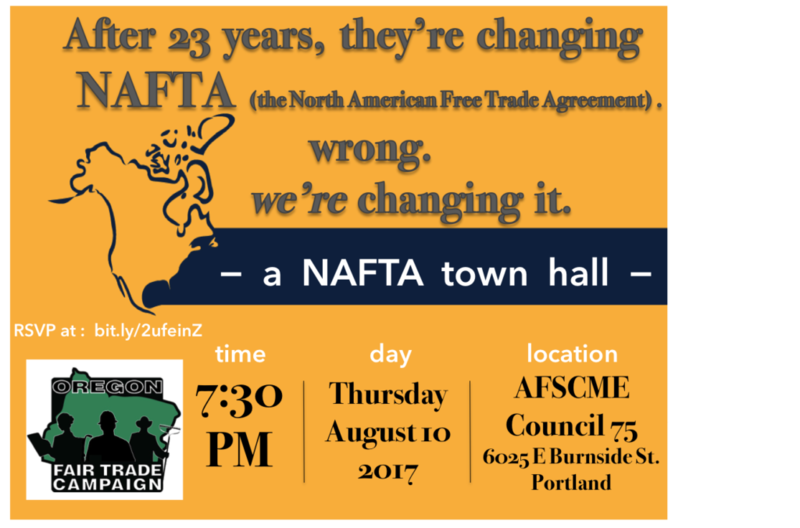 NAFTA Town Hall – After 23 Years. 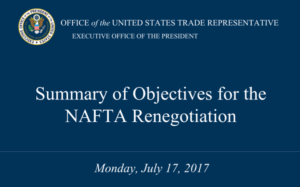 Last week, you noticed that the Trump administration released its document of negotiating objectives for NAFTA 2.0. Our post, as Oregon Fair Trade Campaign, about this is the most previous post on this site. It is our statement of response to the Trump release. People — speaking for their estimable and diverse organizations — who have weighed in include Richard Trumka, James P. Hoffa, Leo Gerard, Robert Martinez, Jr, Chris Shelton, Michael Brune, Bill Waren, Roger Johnson, Juliet Majot, and of course Lori Wallach. Yesterday, the USTR released the awaited (eighteen-page) document outlining its negotiating objectives for when — in thirty days — the U.S. is at the table with Mexico and Canada, to redo NAFTA. You can see the USTR’s document here. Our petition for telling the President and Congress that Trump’s plan falls short, to the point of being unacceptable, is here, and please submit your name. Also, find Citizens Trade Campaign’s statement in response to the release, on their site, here. The Trump administration continually signals to us that it has a values problem and a competence problem. Trump’s politics are not working people’s values. And the blame that he cast during the campaign for folks’ economic hardship was leveled at Mexico, and others, who are getting a better “deal” than we are, supposedly. Trump’s story of grievance missed the mark of an authentic critique of NAFTA. He is a con-man on trade (at least, so far). The TPP and NAFTA to Donald-Trump-the-Candidate were unacceptable, disastrous deals. Yet given the chance to renegotiate NAFTA, the Trump administration has inserted TPP language in the NAFTA objectives. The new NAFTA negotiating objectives are not an improvement over TPP on labor and environment — the provisions there in TPP having been rejected as inadequate by us (and civil society broadly). The administration’s release is vague. It is specific only in one place: in its pushing for the elimination of NAFTA’s Chapter 19, which instituted review panels to help enforce anti-dumping. The fact that the removal of a chapter was mentioned, but it was not NAFTA’s Chapter 11, is a serious point. It means Trump’s intent is to keep the ISDS system in place, whereby corporations can sue governments if the governments have laws on the books that the corporations perceive block their profit-making. Our petition demands transparency, in addition to insisting on seeing people’s real needs put ahead of corporate designs. This comes from Green America. 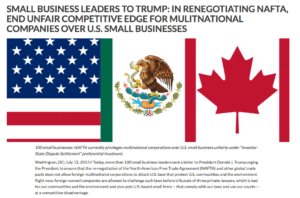 They announce today that 100 small businesses sent a letter to President Trump urging him to side with small business in its opposition to ISDS’s presence in the North American Free Trade Agreement. Investor-State Dispute Settlement (ISDS) is the provision in NAFTA that allows corporations to sue governments (and therefore claim settlements) over their perceived lost profits due to the regulatory actions of those governments. It makes corporations freer to offshore U.S. jobs and it straightforwardly attacks the institution of democracy, in that laws that a voting public sets in place are vulnerable to being overruled by a tribunal of trade lawyers. They operate in secret and by and large serve the model—the free-trade, NAFTA model—which empowered them and which invented this dangerous sort of corporate power-grab. Small businesses know this hurts our communities and lays bare the fact that these free trade agreements are for the largest multinational companies, not the rest of us. Thus it is necessary that while NAFTA is in renegotiation, ISDS be targeted for removal from the text. Find Green America’s announcement here. The letter signers are members of the American Sustainable Business Council and Green America’s Green Business Network. The text of the letter is here. 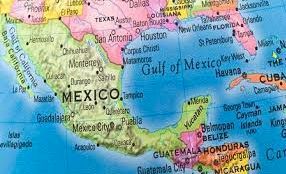 The United States had been in nine years of litigation against the government of Guatemala in the first-ever labor dispute settlement case under the provisions of CAFTA-DR. Guatemala was in trouble for failure to enforce its labor laws. The case closed this past Monday when the panel ruled in favor of Guatemala. Why? Not because Guatemala had met some standard of labor protection. It had not. The panel ruled in favor of Guatemala because CAFTA’s labor-protection enforcement mechanism requires that the party bringing the labor grievance prove that such failure was affecting trade. This bar proved too high a reach for U.S. litigators — at least the way the CAFTA system works.